A diamond-based device capable of switching electrical power at ultra-high voltages is being touted as the first economically viable way to connect offshore wind farms to any point on the grid. Evince Technology, based in Durham, UK, claims its solid-state devices can potentially switch electrical power at 15,000V and above, cutting the cost of solid-state power conversion in half. 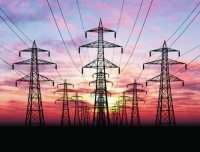 Gareth Taylor, chief executive of Evince, said the technology will make the government’s plans for rolling out smart grids and connecting renewable energy systems to the electricity distribution network more economically viable. Evince is planning to roll out 10,000V diode devices that could make existing high-voltage silicon-based switching devices redundant. This is a significant step for Evince, which was founded in 2008. The company has received funding from Imperial Innovations, the Carbon Trust and NorthStar Equity Investors. Taylor said diamond has been recognised for years as one of the world’s best electrical insulators, but for the past two decades there has been interest in using it as a conductor. Looking into the future, Taylor sees a secure market for Evince’s technology. ‘When people talk about renewable generation, energy-storage systems and energy efficiency, in order for all those things to happen on a practical level, you need to be able to connect all those things together and power electronics is the big enabler of that,’ he said.